If you have downloaded PriceHorse from its official website price-horse.com or it has appeared on your system without your permission, you will probably start seeing annoying commercial advertisements on your Internet Explorer, Google Chrome, and Mozilla Firefox browsers because this application is typical adware (advertising-supported application). As the specialists of pcthreat.com have found out, you will be provided with advertising material, including ads, coupons, sponsored messages, deals, and other commercial offers. This content might seem useful, especially if you often shop online; however, we do not recommend clicking on any of those ads because you might be exposed to potential threats. This is the main reason why we suggest that you remove PriceHorse. If it happens that you decide to do that, you are welcome to use our manual removal instructions. The program promises to help you find the best deals, save time and money as well as enhance your shopping experience. In this sense, it is similar to such programs as LizardSales, PriceChop, and GoSave. Unfortunately, the program is not as useful as it claims to be because its main purpose is to drive traffic to particular websites and advertise different kinds of products. We do not recommend clicking on any of those ads generated by PriceHorse even if they seem completely decent. If you wonder why it is so, you should know that this advertising-supported application might redirect you to the unreliable places. You might come across malicious software there. PriceHorse cannot be downloaded from its official website at the time of writing; thus, our security experts believe that this program slithers onto computer without permission. 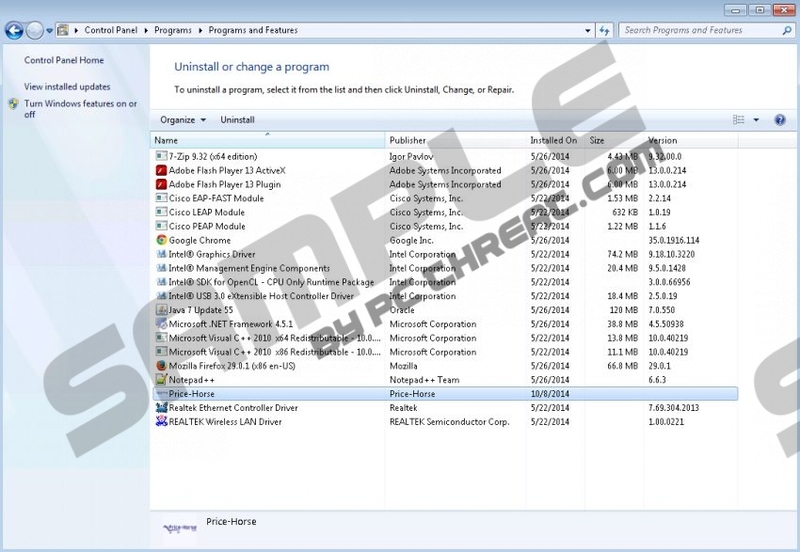 On top of that, you might install it if you click on ads offering to download fake Flash or driver updates. You should never click on such ads if you do not want to end up with a bunch of unreliable applications. These ads are usually placed on various torrent and file sharing websites; however, you might come across them on different unreliable websites as well. In order to delete PriceHorse entirely from the system, you should follow our manual removal instructions that are placed below the article. However, if you do not like the manual removal method for any reasons or it seems too difficult for you, you should know that you can delete all the existing infections with an automatic malware remover. We recommend using SpyHunter because it is completely trustworthy. Quick & tested solution for PriceHorse removal. Thank you VERY much, your solution worked perfectly.